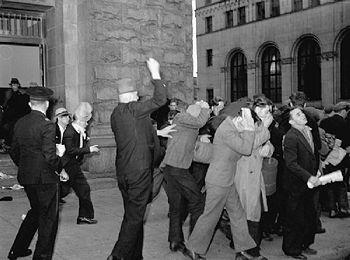 Police beat men as they left the post office in downtown Vancouver. Today marks the 75th anniversary of the police riot remembered in Vancouver as Bloody Sunday. On the occasion, we look back at the life of Steve Brodie, who led the unemployed men in their strike. This obituary was originally published in the Globe and Mail on Jan. 23, 1998. Hero of Bloody Sunday, labourer, seaman, organizer. Born on June 8, 1910, in Falkirk, Scotland; died of cancer in Victoria on Dec. 6, 1997, aged 87. A MAN can pack a lot of living into 87 years, and Steve Brodie didn't waste any of them. Yet for all that he did and all that he saw in his time, he was remembered for what happened one dawn nearly six decades ago, when four Mounties with billy clubs and a Vancouver city detective armed with a rubber hose beat the living bejeezus out of him. 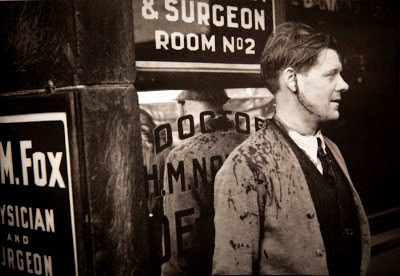 It was June 19, 1938 -- Bloody Sunday -- and much of the blood was Mr. Brodie's. A month earlier, he had led a contingent of unemployed men into the Vancouver Post Office on a sitdown strike. How he conducted himself in those days made him the most admired -- and feared -- man in the city. As a boy in Scotland, Robert Brodie lost both parents to the influenza epidemic of 1919. Five years later, the Salvation Army shipped him and other orphans to Canada, where he found work at 14 as a farm labourer. Mr. Brodie was a Bible-toting man like his blacksmith father, a lay preacher, but at one farm in the Sand Hills of Saskatchewan he came upon a former journalist with a library of radical books. "He told me, 'You are a member of the working class and you have no option but to help them rise,' " Mr. Brodie remembered. "I used to read the Bible to the Indian girl who lived with him, but I was beginning to doubt." 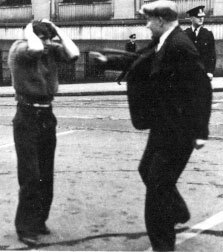 Police thug beats Steve Brodie. In the early 1930s, his livelihood evaporated with the moisture of the Prairie soil. He took to the rails like so many other hungry men. One bitter winter's night, he was hauled aboard a slow-moving freight. An older man dragged him across the dark boxcar and flicked his lighter. At Mr. Brodie's feet, as recounted in Pierre Berton's The Great Depression, were three teen-aged boys, frozen to death. It was in the relief camps that he was nicknamed Steve, for the Irishman who was said to have jumped from the Brooklyn Bridge on a bet. In 1935, Steve Brodie hopped a freight in Vancouver with hundreds of others in an audacious protest. The On-to-Ottawa Trek ended when police attacked a crowd on Dominion Day in an event remembered as the Regina Riot. Mr. Brodie came to believe that capitalism made miserable the many for the benefit of a few. (Nothing he saw later caused him to change his opinion.) He joined the Communist Party, which, with its top-down discipline, would prove an uneasy, and short-lived, fit for the firebrand battler. On May 20, 1938, some two thousand bedraggled men marched in columns through downtown Vancouver. Mr. Brodie led one group into the Post Office, others took over the Vancouver Art Gallery and the Georgia Hotel. The men settled in at the Post Office, sleeping on the cold stone floor. They called it the Hotel Federal. Thousands visited with gifts of food. The pocket-sized Sitdowner Gazette was sold to raise money. Meanwhile, the mails kept moving. Early one morning, the clip-clop of horses' hooves was heard. The police ordered the building vacated; the men, led by Mr. Brodie, said they would submit to arrest. The police refused, firing a tear-gas canister. "Up until that moment, we had lived for 30 days in that building without five cents worth of damage to property," Mr. Brodie later wrote. "Now as the lobby filled with gas, arrangements were made to purify the air by eliminating some three thousand dollars worth of plate glass. . . ."
The sitdowners ran a gantlet of police. The 5-foot-8, 138-pound Steve Brodie was the last man out, his orange sweater a bull's-eye for the waiting cops. He was beaten senseless and left in the gutter. Police refused to call an ambulance. A passerby drove him to St. Paul's Hospital. He had head injuries, nearly lost an eye, and was left toothless. The eye injury prevented him from serving in the regular forces during the Second World War, which he spent in the merchant marine. He later worked in the Esquimalt shipyards, retiring in 1968. Never married, he was a devoted surrogate grandfather and great-grandfather. In recent years, he would meet cronies at a Victoria cafeteria, where they bet on the ponies and Mr. Brodie touted his system for winning at craps with his trademark dry cockiness. He long ago abandoned any faith in political parties, although he remained as angry at injustice as ever. The Post Office he occupied 60 years ago is now home to upscale boutiques, the doorways once again temporary refuge for the homeless. Unlike in his day, they are unorganized and without hope. Tom Hawthorn is a reporter with the Victoria Times Colonist. The occupation of the post office had been peaceable until police ran amok. Steve Brodie was my grandfather and I just wanted to say thank you for this post. He was an amazing man, a loving and fun grand and great grandfather and is missed very much. His efforts are a reminder to all that we are all in this world together and life is about helping each other.